Well, as I look at this blank page, I immediately want to fill the void with hole puns, because I’m the type of person to never do anything halfway. Donut County began as somewhat of a pun, a joke within itself. During the credits it’s revealed that it was born from a Peter Molydeux tweet, the famed Twitter account parodying real-life game designer Peter Molyneux by tweeting out bizarre and unrealistic game ideas. Clearly not too unrealistic, because Donut County’s creator, Ben Esposito, was able to shape that idea into a addictively engaging game. Somehow, Donut County also manages to find a heart and present compelling themes for players to think about. 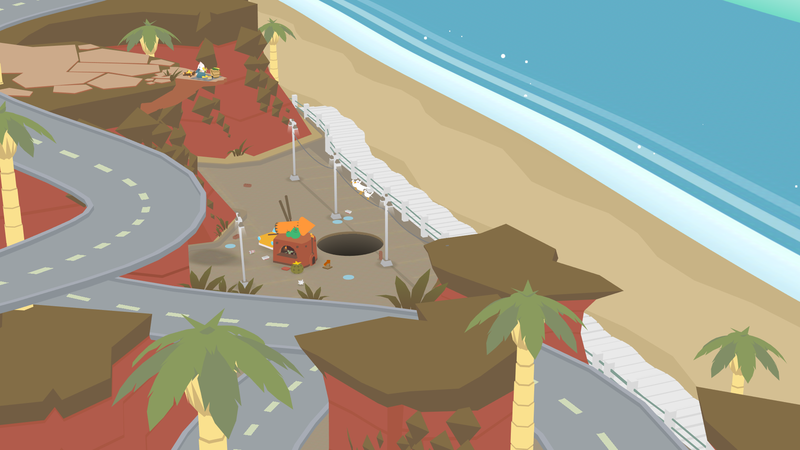 In Donut County, you play as a hole. Well, kind of. You play most of the game as BK, a raccoon with access to an app that controls holes that swallow an entire county. Whenever anybody in Donut County orders a donut from the local shop, they are sent this ground donut instead, also known as a “hole” in most circles. Rather than getting a delicious doughy confection, it eats them, their stuff, and everything around them. Starting off small, the hole may consume some grass, bricks, or other pieces of trash. With each object it consumes, it grows bigger and bigger until it’s large enough to eat entire buildings, enormous boulders, and even a roller coaster. The idea of consuming to increase the size of the void is an inverse to mechanics that exist in games like Katamari Damacy and Tales From Space: Mutant Blobs Attack. In those, the things you consume become part of you and add to your size. In Donut County, the things you consume add to the nothingness, expanding the gaping well in the ground to allow it to consume even more. Are you starting to see the theme that this game might be going for? Told across multiple brief chapters, Donut County is able to feel like an easily consumable bite-size experience. You’ll relive the harrowing stories of how each member of Donut County’s community had ordered a donut and subsequently fallen victim to the gaping maw. By harrowing, I actually mean that Donut County’s entire aesthetic and vibe is quite zen. Yeah, sure, so you’re devouring an entire town and its inhabitants, sentencing them to a life nearly 1000 feet below the surface, but I sure felt calm and relaxed the entire time I was doing it. The flat and simple, modern look of the art is striking and unique, but can occasionally get in the way of gameplay. The sense of depth in the two-dimensional image can easily be lost in the art, which can make judging the size and location of the hole a little problematic at times. Occasionally I had to move it around a bit before finding the sweet spot that allowed the next object to tip in and disappear into the earth. Donut County is simple enough that it never became a huge issue for things like puzzle solving and is a minor nitpick at best. Part of that is due to Donut County’s rather simple puzzles. After living out the stories of each resident that got swallowed up and realizing the game’s clear themes regarding gentrification, addictive behaviors, and all-consuming technology, the whole thing takes an interesting twist. Donut County constantly pushes that what BK is doing is wrong (subsequently making the player feel bad for the relaxed manner in which they swallow up the town), so it needs a redemptive conclusion to some extent. The first half of the game is nearly devoid of puzzles, simply asking players to drop objects into the hole. The latter half begins to introduce more puzzle elements which rarely pose any kind of real challenge until the game’s final moments. Even then, the game seems to be designed to push you into a win. Throughout the tranquil moments of what should be rather horrifying, Donut County hides a number of messages to the player. The addictive kind of peace that comes from completely clearing an area of all objects allows for the message to more easily be perceived. There are the obvious allusions to the absolute void that being addicted to technology can lead to, and Esposito himself has talked about how gentrification of where he lives gave birth to a many of the themes present. If you played Tales From Space: Mutant Blobs Attack, you might be expecting Donut County to do something similar, with each level being larger and larger than the last (spoilers for the end of Mutant Blobs Attack, you eventually become so big from consumption that you eat the entire solar system). Donut County doesn’t work this way. You aren’t growing the hole until it drops the entire continent into its depths. Each story starts fresh with a new small hole that begins its assault on the objects and creatures in the area. 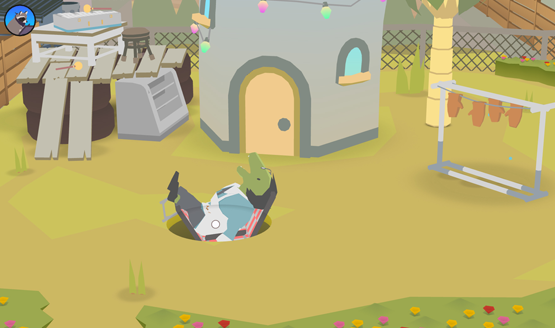 While this twist disappointed me at first, I actually came to appreciate the intimate moments that it provided, seeing how the all-consuming void impacted each resident of Donut County as the land became pockmarked like apocalyptic swiss cheese. If you’re looking for something that will challenge you and twist your brain into knots, this game isn’t it. There’s no real skill curve, and most of the puzzles are simple enough that you can more or less accidentally stumble on the solutions, with a few rare exceptions. But I assure you that from the first moment you tip something into that hole and see it grow, you’ll be hooked. You’ll want to consume everything, making the void of consumption grow ever larger. No, I’m not talking about getting addicted to Twitter or Reddit. I’m talking about Donut County. It’s brilliant, it’s charming, and it’s simple, but I would never call this hole shallow. It holds a depth in its tranquil destruction, a surprisingly refreshing and unique experience, on the (w)hole. Donut County review code provided by developer. Version 1.00 reviewed on a standard PS4. For more information on scoring please see our Review Policy here.